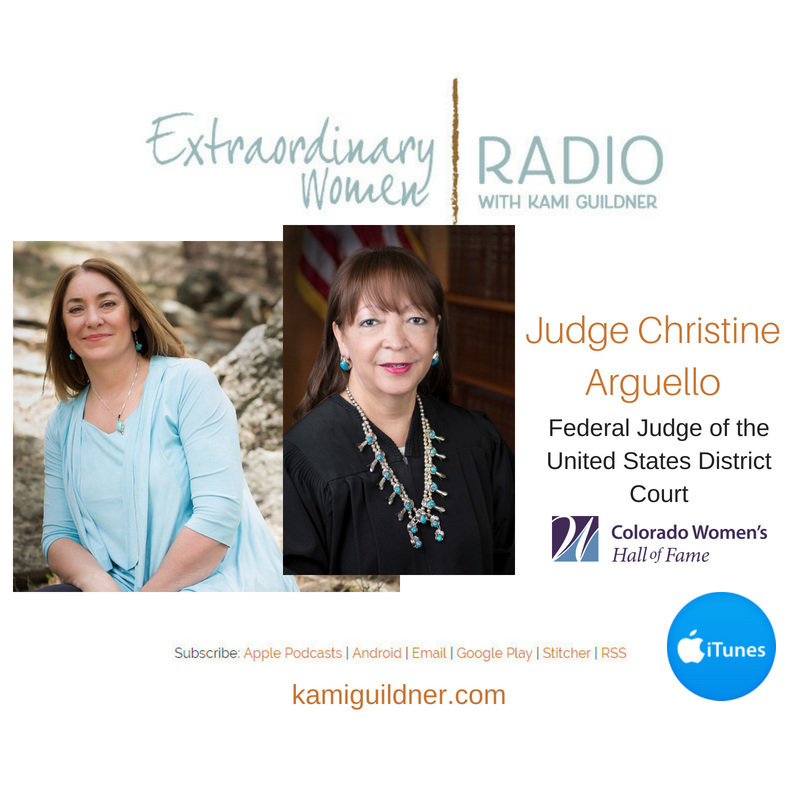 Today’s Extraordinary Women Radio interview with Colorado Women’s Hall of Fame Inductee, Judge Christine Arguello is filled with stories of the importance of raising one another up. Christine is a Federal judge of the United States District court for the District of Colorado, nominated by the President of the United States, confirmed by the US Senate, and appointed for life. Her journey to break barriers, as a first-generation high school and college graduate – is filled with stories of mentors and others who reached out to help raise her up. Today, at the pinnacle of her career as a judge, Christine makes the space and time to raise up others with her non-profit, Law School…Yes We Can (Sí Se Puede), a law school mentoring program. Prior to her presidential appointment to the bench, Judge Arguello’s career included partnership at two private law firms, Holland & Hart LLP and Davis Graham & Stubbs LLP – and she also served as Chief Deputy Attorney General of Colorado. In our interview, Christine shares that it’s our responsibility to reach out and help another climb the next mountain before them, and shares a stanza from a poem called Success, “To know that one life has breathed easier – this is to have succeeded. My invitation to you… how will you help raise up those around you in the coming months? Make space to ponder this question as we start to embark upon the Fall season that will upon us soon. Let’s meet Judge Christine Arguello – another Colorado Women Hall of Fame Inductee. Kami is honored to partner with the Colorado Women’s Hall of Fame, sharing the stories of their Inductees. You can listen to other Colorado Women’s Hall of Fame interviews here!